In November 2009, “America’s Test Kitchen’’ host Chris Kimball and his staff took on a culinary adventure: They re-created a 12-course Christmas dinner originally hosted by Fannie Farmer, Boston’s famed Victorian cookbook author. At the center of the endeavor, which took four days to cook in heat so blazing that the director’s pants began to melt, was a wood-fired stove. This was no ordinary stove: Sixty-seven inches wide, six burners across, and more than 100 years old, the Cyrus Carpenter had been restored by Littleton craftsman David Erickson into a gleaming workhorse that looked as new as the day it emerged from the factory. The dinner in Kimball’s South End townhouse evolved into a documentary, which recently aired on public television stations, and a book by Kimball, “Fannie’s Last Supper.’’ Kimball thanked Erickson in his book for restoring the stove that was the “heart and soul’’ of the project. “He is an artist of cast iron,’’ Kimball wrote. It was another turn in the spotlight for Erickson, who has been giving old stoves new life for more than 30 years in his workshop, a Victorian-era train depot. One of his stoves recently won honorable mention in “Steampunk: Form and Function, An Exhibition of Innovation, Invention & Gadgetry,’’ at the Charles River Museum of Industry & Innovation in Waltham. Erickson is a bit bemused to see his specialty be come known as steampunk, a movement that takes Victorian objects and makes them useful with modern technology. Another of Erickson’s stoves will appear in an HBO miniseries, “Mildred Pierce,’’ based on James Cain’s novel about a single mother who opens a diner in the Great Depression. Starring Kate Winslet, it is due to begin airing in March. When Erickson got the call from HBO last year, he just happened to have on hand a renovated 1917 Vulcan that came from the kitchen of famed Broadway and Hollywood composer Richard Rodgers. Erickson was an industrial arts teacher at the Perkins School for the Blind in Watertown in the 1970s when he stumbled into the business of restoring old stoves. He bought the old train depot, where he and a mentor planned to offer woodworking classes. The building had electric heat, which Erickson couldn’t afford. This was during the mid-1970s energy crisis, and Erickson already had a summer business delivering firewood. So he bought an ancient woodstove in Maine and brought it to his shop at Perkins to fix it up. A music teacher at the school dropped by one day and saw the stove on the workbench. He left Perkins in 1980 and began restoring old stoves — and occasionally, old refrigerators and old sinks — as his full-time job. 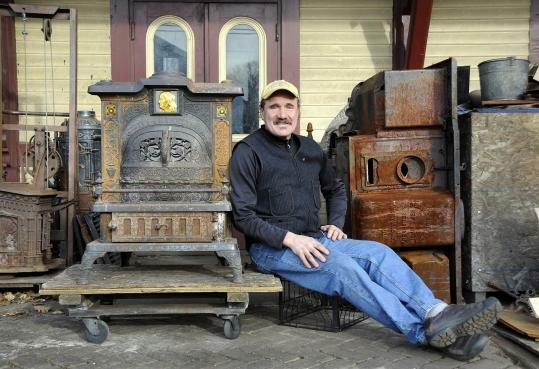 Erickson’s Antique Stoves Inc. has one other employee, who has been there 22 years. His clients have included Ralph Lauren and Whoopi Goldberg. But usually, Erickson’s projects end up in the working kitchens of ordinary customers, who generally live in New England. He delivers the stoves and teaches their new owners how to use them. Erickson loves to restore the old stoves to their original condition, disassembling them and sandblasting the parts to clean away decades of rust and grime. He rebuilds parts and orders custom-made nickel plating from a foundry in Wisconsin. But sometimes he comes across beautiful old stoves that have been irreparably damaged from high temperatures. The stoves are too impressive to discard, so Erickson began adding new components, to allow them to work in new ways. He’ll take a century-old stove and add a new cooktop and electric oven, hiding the controls behind a door. John Buscemi was a rare customer who wanted an old stove that still burned coal. Buscemi, owner of Belfry Historic Consultants in Lynn, had long cooked on a coal-fired stove, and was happy to discover an old chimney after moving into a house. 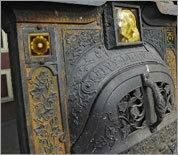 When he found a local distributor who would deliver coal, he began to search for an old stove. Buscemi visited a lot of restorers before he found Erickson’s shop. Erickson sold him a restored Glenwood Gold Medal stove, which burns both coal and, for warm-weather cooking, gas. Erickson had updated the gas mechanism in the stove with modern conveniences like a pilot light. Buscemi, whose business supplies fabrics, wallpapers, carpeting, and trim to museums and historic houses, saw in Erickson a kindred spirit, with the same dedication to historical accuracy. Chris Kimball had contacted Erickson two years before the Fannie Farmer dinner for help with the stove. It had lived in the basement of Boston’s St. Botolph Club for decades, and was built into the brick. It took Erickson and his employee two days to free the stove so they could take it back to their shop. After dismantling the stove, they sandblasted it, welded parts that were cracked or broken, and recast some parts at a foundry. The two upper ovens were rotted from years of dampness, so Erickson remade them in stainless steel. He added a new grate, so the coal stove could burn wood. They then reassembled the stove, cemented the joints and sprayed it with a special high-temperature paint before turning it back over to Kimball. Kathleen Burge can be reached at kburge@globe.com.